Opportunities for sponsoring the 2018 AAC have closed, however please do get in touch if you are interested in sponsoring the event in 2019. 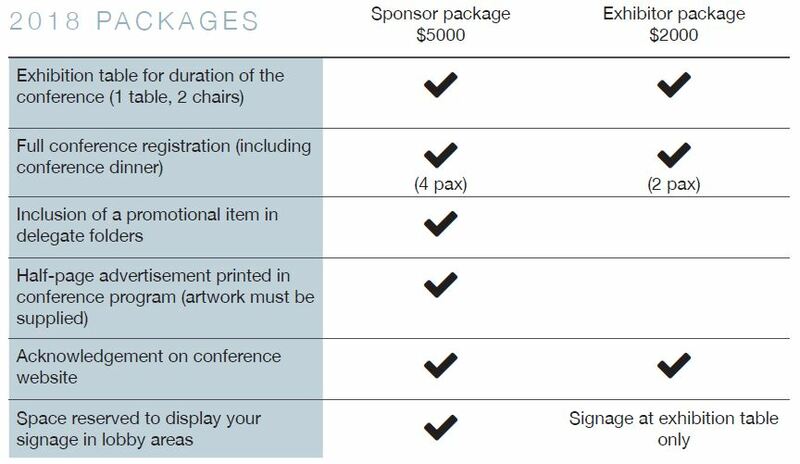 Why sponsor or exhibit at the 2018 AAC? The Australasian Aid Conference is one of the premier opportunities to connect with leaders in aid and development policy and research in Australia, the Pacific and Asia. Our conference attendees range from high-level executives from international NGOs and development contractor organisations, senior bureaucrats from a variety of Australian commonwealth departments, and leading international academics working in aid and development, as well as representatives of national NGOs, early-career researchers, and students. As part of the two-day conference program we allow time for networking and informal discussion, offering prime opportunities for engagement and increasing your visibility amongst key decision-makers in Australia’s aid and development sector. Your sponsorship also enables us to waive travel and conference costs for a number of PhD students and developing country participants. Depending on your requirements, we may also be able to tailor packages - please contact us to discuss options for customisation. Download our sponsorship and exhibiton prospectus here. For more information and to book a sponsor or exhibitor package for the 2018 AAC, please contact us on devpolicy@anu.edu.au.